According to a survey by the National Association of Home Builders more than 70% of buyers want an island in their kitchen, and of those, 50% consider it a must-have. Since it is apparent that adding an island is a sound investment, we have gathered 60 of our favorite kitchen island ideas to use for inspiration. In addition to being a visual anchor in the space, they are also help increase the room’s functionality and efficiency. Kitchen islands serve a number of purposes. There are many different ways you can approach the decision, and since an island takes up a significant amount of floor space it’s worth it to take time to make every element of its design intentional. A good general rule for enclosed kitchens is to place it in the center of the room. That way it is equally accessible from all sides and won’t be an obstacle for people walking through. That placement might not work best for all kitchens, however. To add additional seating from creating more counter space, we have selected a few different kitchen island ideas that will help you get the most out of it. To create the feature that works best in your room, choose one or combine multiple of the design elements below. Create contrast by using a different material or color for the island counters than you did in the rest of the room. Try black or a dark stained wood for the island if your regular countertops are white quartz. 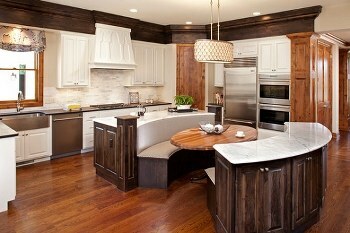 Installing an island by adding extra work space and decorative interest to your kitchen will need a little extra oomph. The kitchen island can be as simple as a console or as elaborate as a custom built-in cooking center. To make islands architectural beauties in the kitchen you have to put details such as marble or wood countertops, brass fixtures, and even inset ranges. 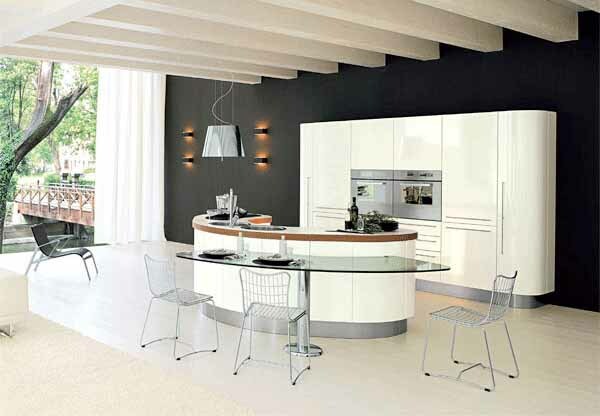 To either blend with you existing kitchen or contrast with the space, a kitchen island can be designed in any style. Traditional, contemporary, or country, whatever your style, an island can be designed to suit it. Kitchens are getting bigger and designers are using industrial appliances, state of the art cabinets and countertop materials, to create islands that are a statement in the kitchen and the perfect place for family and friends to gather. Think about how you want to use a kitchen island first if you are thinking of incorporating it in your home. Will you need a combination of extra counter space and storage? Will you need an extra sink, refrigerator, or cooktop? How about electrical outlets? A sinle surface is the simplest and most common kitchen island has. 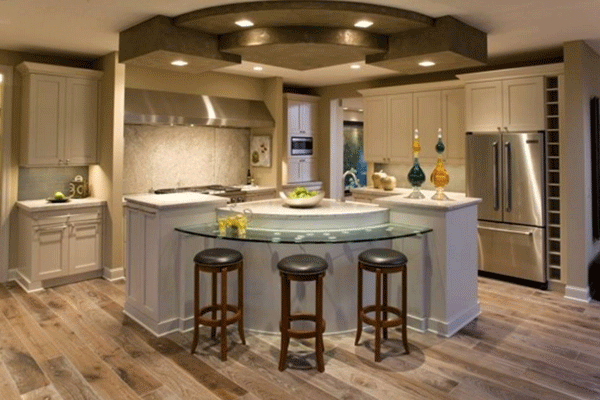 But a multi-level island can incorporate both food preparation and areas for guests to eat. Narrow island might be the right fit if you live in a small space, a longer. The island is also the place for additional accessories that you need to reach at a moment’s notice, so think about places to install a wine rack, sink, drawers, and other amenities that can come in handy when you are cooking. Be sure to build an island with planty of room to work in the kitchen. The area of movement between the sink, stove, and refrigerator is called triangle. Try not to interrupt the efficient movement from applicance to work center when thinking about installing a kitchen island. The walkway between island and stationary cabinets should be about 36″ to 42″ wide. If the kitchen island will be located near a plain wall, 36″ is sufficient clearance. But if the kitchen island stands near a stove, refrigerator, or dishwasher, 42″ or more are required to allow for safety and ease of use. You want to be sure that you can easily open and close doors of appliances without hitting the new island. To significantly increase the amount of counter space in your kitchen, keep it simple while adding value by using an island. Having more counter space adds obvious benefits: more room for meal prep, multiple chefs and can serve as an eating area. Whether your space lacks a proper dining table or you are looking to create a more casual bar seating option, adding low-profile seating to the islands is an easy way to increase functionality and make the environment more social for both guests and the cook. Create a breakfast bar or dining table, and leave a counter overhang that offers enough room to tuck the chairs or stool underneath when not in use. Spread the workflow throughout the kitchen by incorporating sinks or stovetops into the surface of the island is one way. Installation can be tricky, so pay attentioan to details like ventilation and plumbing. This will require running downward, most common in islands or overhead venting which can be expensive, and allocating extra space to in-cabinet pipes. By creating variation in the height of your island, add another dynamic. Using the island for multiple purposes, like eating and food prep, will both maximize the utility and make it feel like two totally different spaces. For example, add an appliance to one level like a sink or stovetop and create a breakfast bar on higher tier. An island is also a way to add moer storage and avoid kitchen clutter by using drawers, cupboards and shelves in addition to creating more counter space. This is beneficial especially if appliances take up a lot of cabinet room, or if you are looking for a unique way to showcase certain items by using open shelving. Store dishes and pots within reach or keep less frequently used appliances out of the way. Another option is to use open shelving to display cookbooks or other items. By adding suspended storage, take advantage of being able to use the space above the island where you can display a metching pan collection or your best stemware. You can use the space for the range hood if you have decided to install a stovetop with overhead venting and you can also experiment with lighting elements. Small Kitchen Islands, a small kitchen design does not have to result in a recipe for disorganization and too little counter space. In fact, the addition of a kitchen island can provide extra storage room and a place for food preparation, making the space more manageable. It is important to thoroughly consider the size of the space you will be working with in order to find a kitchen island that will be efficient when designing the kitchen layout for a small space. Decide on where you will be placing the kitchen island and how tall you would like for it to be. Home goods stores are ideal for choosing ready-made kitchen islands, like a butcher’s cart, that will easily fit into a small kitchen space. But repurposes items, like a small desk, bookshelf, dining table or crates can also make an interesting, unique kitchen island. Simply choose the item with which you will be working and top it off with your desired surface, like a stainless steel countertop. For storing kitchen items, book shelves or openings in crates can be used like appliances and cookbooks. You may have room for a kitchen island with seating by squeezing in a stool or two on one side depending on available space. 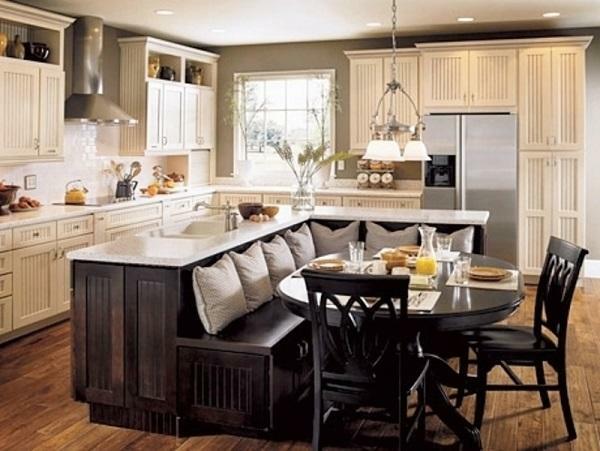 Consider purchasing a seat that can be easily moved when you need to use the island for other purposes if you only have room for one. Large Kitchen Islands, a large kitchen island might be ideal for additional storage and food preparation space when space is not an issue. A large kitchen island can be an ideal addition to any kitchen area when space and budget allow. A large kitchen island can be useful in helping bring all three elements to one convenient space whether you are looking for extra seating, storage or room for food preparation. You can begin to choose the design elements that are important to the function of your kitchen once you have determined how you will be using your large kitchen island. Be sure to choose a kitchen island that allows for stools and adequate leg room if you are looking to add more room for dining. A large kitchen island can also accommodate an additional sink or cooktop. These features can be especially helpful to people who prepare the majority of their meals at home. You might also want to consider a wooden surface for chopping or stainless steel countertop for easy clean up if cooking is a priority for your large kitchen island. Be sure to look at examples of large kitchen islands in order to have a better idea of what you want from your addition. It might also be helpful to consult friends who have a design that is similar to what you are seeking.